In this post, you learn to create a currency converter app. This currency converter can be used to convert twelve currency types. The currency types that the converter supports are shown below. To follow this tutorial, you will need to create a new Android project in Eclipse. The project will be named CurrencyConverter. 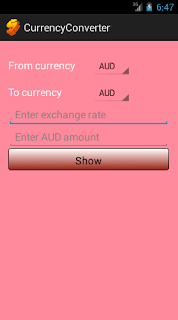 In the CurrencyConverter app, the user is allowed to select a pair of currency for the conversion. One is the currency that will be converted from and another is the currency that will be converted to. We also allow the user to input the exchanged rate and the amount to be converted. One button is provided to show the table of conversion. The table displays the currency types and amounts. The currency types that are not the target of the conversion, their amounts are calculated based on their default average exchange rates. For target currency type, its amount is calculated based on the exchange rate provided by the user. The target currency is highlighted. In this CurrencyConverter app, there are two activities. On activity is the main activity that starts when the app initially runs. The components or view that are used to construct the user interface of the main activity are two TextViews, two Spinner, two EditTexts, and one Button. The two TextViews to display the labels of the Spinners. The two Spinners allow the user to select a currency type to convert from and another currency type to converted to. The spinner_style.xml file defines the item style of the Spinners. One EditText is for the user to input the exchange rate and another one allows the user to input the amount for converting. The Show button will be pushed to display the conversion table. This button has background style that defined by the bt_style.xml file. The activity_main.xml file that is the resource of main activity is written as shown below. The main activity is defined by the MainActivity class. Besides loading the components from the activity_main.xml file, the MainActivity has code to set up the item data of the Spinners. This task is done by calling the setupSpinnerData method. To capture the From currency and To currency, the two Spinners has to register to the items selected event. When the user selected a currency from the first Spinner, the selected currency is stored in the fromCurrency variable. Similarly, the selected currency from the second Spinner is stored in the toCurrency variable. The showResult result method is invoked when the user pushes the Show button. Before showing the conversion table, the app checks to make sure that the exchange rate text box and the amount text are not blank. The alert dialog box is displayed when he/she tries to click the Show button with the blank exchange rate or amount. The intent object is created to put some data such as From currency, To currency, exchange rate, and amount. The intent object that contains the data is sent to the second activity after the startActivity method is invoked. Below is the content of the MainActivity.java file that has the MainActivity class. Another activity is called ConversionTable. It shows when the user pushes the Show button. This activity displays the conversion table as i mentioned above. This activity has a resource xml file called activity_conversion_tabl.xml. This file defines one ListView component to show the conversion table. When constructing the conversion table, you will need the icon images of the countries that their currency types are used in the CurrencyConverter app. You can download the icon images from here. In default, ListView in Android displays on text. 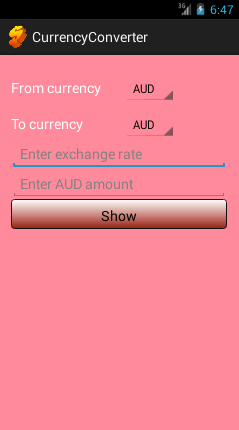 However, this CurrencyConverter app, the conversion table has to display icon images, currency types, and amount text. We have to customize the ListView to do this task. To customize the ListView, you start from defining the components for its item. The ListView has its own layout file called listlayout.xml that defines the layout of its item or row. The content of the listlayout.xml file is show below. In this listlayout file, we define three components-- one ImageView, and two TextViews. The ImageView will display the icon image. One TextView displays the currency type, and another TextView displays the amount. Next, you need to extends the ArrayAdapter class that acts as the data source of the ListView. This class is called ListAdapterModel. Its getView method is overridden to allow the ListView to display icon image, currency type, and amount. The default average exchange rates are used for the currency types that are not the target. For the target conversion currency, the rate input by the user will be used. The clist array contains all currency types that are supported by the CurrencyConverter app. The amounts array is used by the ListAdapterModel class to display the amounts and the clist array contains the currency types to show with the amount on the conversion table. The icon image list is not defined here. It is in the ListAdapterModel class. The AndroidManifest.xml file is modified to allow the second activity to be the child of the main activity. When you are on the second activity and press the back button, you will come back to the main activity. The content of the AndroidManifest.xml file is shown below. Now you are ready to run the program. If you have any questions, please write them at the comment section. I will reply as soon as possible. Thank you for reading this post. 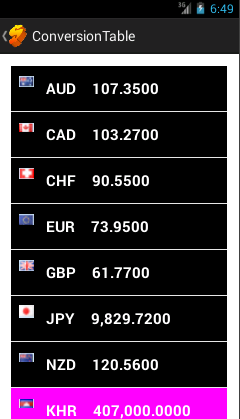 Download the apk file of the CurrencyConverter app. como transforma isso tudo em arquivos apk, para fazer a instalação no andoid? very nice app, but please, can you write the ConversionTable.java code? Thank you so much for your tutorial. How would it work as unit converter for measurements ? There is no ConversionTable class plz send me this class..
New york: Although your Tar High heels lost inside the ACC match semifinals, one of several Duke on the rules for a lot of the initial one half. Justin Knutson, who has got developed your good edge gameplay, and a foul-free Joel Berries II are the keys. No matter whether you’re always over the fencing that 8-9 sport, or are seeking a total opinion on your Very last Some selects, we’ve bought everyone taken care of which has a position of their 68 clubs in the event. Anybody can together with generate the one you select upon hundreds of mid-major darlings you’ve already been eyeing designed for worried potential. Villanova: The superior general seedling. Despite the team’s placement in the hardest location (the East, using matchups vs Duke along with SMU looming), Villanova’s three-man unpleasant heart involving Jalen Brunson, Josh Hart along with Kris Jenkins offers the potential to help you repeat as indigenous winners. nzaga's defensive lapses in those final minutes. Against 16-seed SDSU, the Bulldogs led by only four points at halftime and made just 31 percent of its shots in the first half of a first-round win. They beat SDSU by 20 points and Northwestern by six points. The Bulldogs advanced. That's what matters. They did not move forward via their most impressive performances of the season. Valuable information in your blog and I really appreciate your work and keep it up dude I really very informative blog about the Fast Currency Converter App keep posting. ForexTrendy is an innovative program capable of detecting the safest continuation chart patterns. It scans through all the forex pairs, on all time frames and analyzes every possible breakout.